It does not matter who you believe created earth, nor the name that you call him, one dive on the Ribbon Reefs and you will know that the creator is a show off. This stretch of 55 miles of reef is breath taking beautiful. The Ribbon Reefs, numbering ten individual reefs, are part of the northern portion of the Great Barrier Reef and is isolated from the main land. Most of the reef is on the edge of the continental shelf. 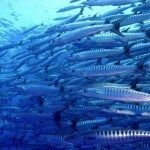 This means that it is near deep water, deep water that will bring nutrients and pelagic species to the reef. 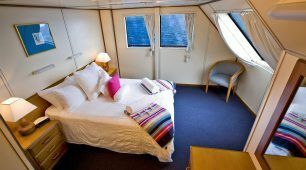 While only a few Liveaboards visit the area the dive sites are known the world over. The Ribbon Reefs are a destination that every diver should visit. Associated with the Ribbon Reefs is Lizard Island, which is at the northern reach of the reef. Lizard Island was once visited by the explorer James Cook, who climbed its peak to try to find a path among the reefs. The island received its name because of the large number of Lizards living on the island at that time. 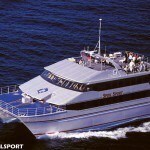 Today Lizard Island is a National park and is the home of a Coral Research center and a small exclusive resort. 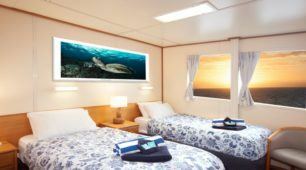 Lizard Island represents the turn around point for the Cairns based Liveaboards that sail the Ribbon Reefs. 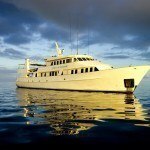 There are a number of excellent dive sites near to Lizard Island, one that is often visited by the Liveaboards is the Snake Pit. The dive site is between 10 and 30 meters deep and is somewhat isolated from other reefs. The reefs name is from the number of Olive Sea snakes that make their home on the reef. Olive sea snakes are not deep water swimmers, so they tend to stay around the reef. While the reef is not on the continental shelf there are few obstacles between it and the shelf. 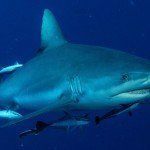 This provides a direct path for large pelagic specie is such as sharks, barracuda and tuna. The most famous of the Ribbon Reefs is Ribbon Reef 10, which is the home of the Cod Hole dive site. 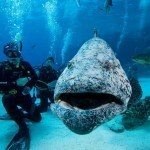 Potato Cods are a member of the grouper family, a family known for its large size and friendliness to divers. These cod can reach 2 meters in length and an average size one will be near diver size and can weight more than 90 kilos. These fish are slow moving except when it is time to eat. Fish feed is often done at this site, bringing the inquisitive fish direct to you for a snack and then they hang around to see what you are doing. Also on the same reef is an area called Cod Wall which is a wall dive. A strange sight that you may see here is a line of Queensland Cod facing the current from the deep water with their mouths open. Queensland Cod is a slightly smaller member of the grouper family. A section of the reef called shark alley is where you frequently can find sleeping white tip sharks sleeping in the sand. Acropolis dive site by ribbon Reef 9, has been on a number of best dive sites in the world list. It is known for its rolling hills of hard coral including plate coral and staghorns. In the winter months the Great Barrier reef is visited by Dwarf Minke whales, they follow the Great Barrier Reef from their Antarctica home to warmer waters in the north of Australia. The upper Ribbon Reef is often a destination for these whales.